Kimberley Hay won her 3rd National title beating number 2 seed Millie Tomlinson 3-0 in the final held in Manchester’s national centre on October 28th. Kim won event without dropping a game in the whole event! Kim wasn’t the only Northumbrian to play in the event. 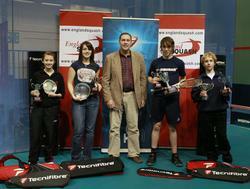 Lucy Beecroft and Maria Bainbridge played in the girls U13 and Richard Shellam played in the boys U17. Lucy was unseeded and upset 9/16 seed Eleanor Epke and then beat 5/8 seed Katie Wilson to reach the quarter-finals and lose closely to eventual winner Fiona May Murphy. Maria also upset a 9/16 seed in the first round beating Alice Harvey to then narrowly lose to 5/8 seed Lauren West. Shellam also done well winning his first round against Robert Dadds and nearly causing an upset against 9/16 seed David Wardle eventually losing 3-2.